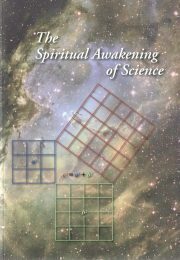 The Spiritual Awakening of Science considers key points in the historical development of science and their relation to the search for direct experience of reality through meditation and related practices. The presupposition of this whole scientific movement was thus that, if you went about it the right way, the world was understandable, and mathematics provided the most powerful way of analysing it. By careful observation and measurement of the facts, and thinking about them, you could work out the explanation. In this way the Greeks began the study of ‘natural philosophy’, or what we would now call physics. But it must have very soon become apparent that, compared with the sun, the moon and the solar system, there were many things in the world—and perhaps, above all, people!—which were much more difficult to understand and much less predictable. Human behaviour was apparently relatively haphazard and arbitrary, dependent on the whims of the will. Human actions often seemed to proceed from sudden impulse or hidden motives, and you never knew what people were going to do next. Moreover, with regard to scientific enquiry, individuals had all sorts of strange ideas about things—including many strongly-held views and prejudices, impervious to reason—and these got in the way of finding the facts and distorted the truth, even about the world of nature. So, as well as the principle that the world was understandable when the right methods were used, science developed a strong bias in favour of objectivity, and a conviction that in investigating the world one must reject all personal preferences and put oneself in the position of an impartial observer, simply looking to see what the facts were. As far as possible, the subjective element was to be eliminated, and the scientist was to be an objective spectator in studying nature. There is, however, so I believe, a second feature [of Greek science], much less clearly and openly displayed, but of equally fundamental importance. It is this, that science in its attempt to describe and understand Nature simplifies this very difficult problem. The scientist subconsciously, almost inadvertently, simplifies his problem of under-standing Nature by disregarding or cutting out of the picture to be constructed, himself, his own personality, the subject of cognizance. Inadvertently the thinker steps back into the role of external observer. This facilitates the task very much. But it leaves gaps, enormous lacunae, leads to paradoxes and antinomies whenever, unaware of this initial renunciation, one tries to find oneself in the picture or to put oneself, one’s own thinking and sensing mind, back into the picture. The Spiritual Awakening of Science will be of interest to students of history and the history of thought. Some seekers with a knowledge of scientific ideas and commitment to scientific method may find it helpful to find the connections between scientific progress and the search for direct experience of reality through meditation and related practices.